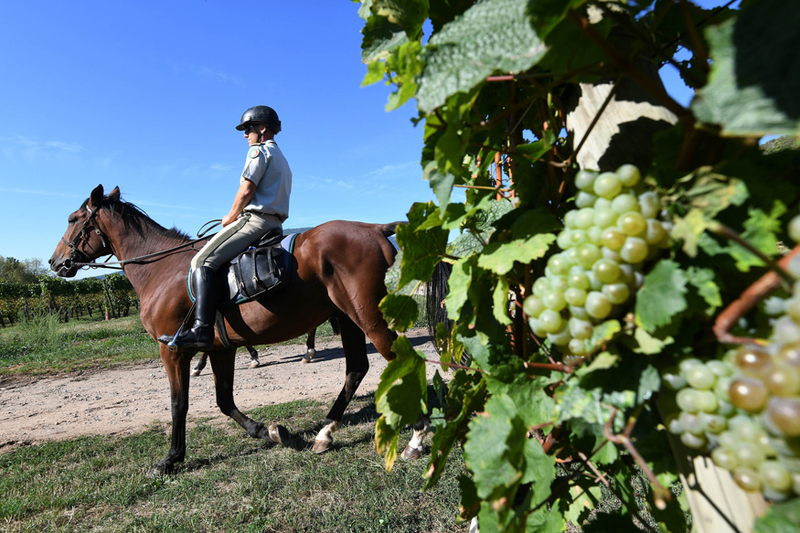 Few places are more peaceful than the gentle slopes of France's Alsace wine region -- but should any heinous crimes like grape theft occur, Jason the horse is on hand to catch the perpetrators. Jason, a handsome black-maned chestnut, is part of a "green brigade" charged with environmental protection in the Haut-Rhin region bordering Germany and Switzerland. "Horses are the best way of getting around places where you can't go by car," says his rider, 52-year-old Nicolas Krust. Over the course of a day, Krust and his equally uniformed patrol partner Daniel Dagon amble 40 kilometres (25 miles) around the little town of Soultz-Haut-Rhin on the lookout for delinquents among the vines. "It's rarely big heists," admits Dagon, who is about to celebrate 10 years riding his gelding Seigneur. "But thefts of a few bunches of muscat grapes often get reported." Wine grapes tend to have thicker skins than those grown for the table and are less crunchy, but the muscat variety is popular for both eating and wine-making. The picking season for grapes used in Alsace's sparkling cremant wine may be over for the year, but the harvest is still in full swing for many other varieties in the region, leaving the vines vulnerable. People caught stealing grapes face a fine of up to 500 euros ($585) and an official report is sent to local prosecutors, who decide whether to follow up with an investigation. Home to around 6,000 people, Soultz-Haut-Rhin, about 50 kilometres from the German border, is not exactly a hotbed of crime -- Krust sees one or two such cases go to police every year. "You still need to be there to witness it," he said. Roland Martin, the mayor of neighbouring Wuenheim, thinks it's thanks to the patrols that the local community sees so little crime. "For several years we haven't had many problems with theft which is linked to the presence of the green brigades," he says. Founded in 1989, Haut-Rhin's green brigade counts 63 officers, 16 of them on horseback. Their remit ranges from patrolling the forests to preventing litter. "They have a deterrent effect that prevents vandalism and theft," said Denis Meyer, a town councillor in Soultz. Stopping to nibble on the weeds or even to help themselves to some grapes, the horses meander through different plots -- some growing aromatic gewurztraminer vines, others light pinot or sweet muscat. With no crimes to report this morning, Krust and Dagon take on the role of ambassadors for environmental protection, chatting to joggers, cyclists and hikers who stop to give the horses a pat. In August, Soultz and Wuenheim ban cars from the small rural roads serving the vineyards until the end of the picking season, apart from those of the growers themselves. "This allows growers to work freely in the fields and limit the risks of thefts facilitated by a car," said Martin, the mayor. The patrollers flag up cars parked illegally near the vines -- "the bulk of our work during the picking", according to Krust. "Every year we hand out between 50 and 100 tickets for bad parking." This morning there's a car blocking their path, and nearby, a straw hat poking out of the rows of red muscat grapes. The brigadiers approach to investigate. Veronique Zimpfer, owner of both the hat and the vines, is quite happy to submit to an ID check. "If there are no checks, people will just act as they please," says Zimpfer, who owns around 100 hillside vines in Soultz. She adds that the fields see more petty crime than you might think: grapes pinched, whole vines uprooted, and even cases of abandoned drug syringes. "We can't always be here, so we don't always know what's happening during the picking season," she says. "It's reassuring to know that someone's watching over us."